The right for individuals to practice religion, or no religion at all, is among the most fundamental of the freedoms guaranteed by the Bill of Rights. 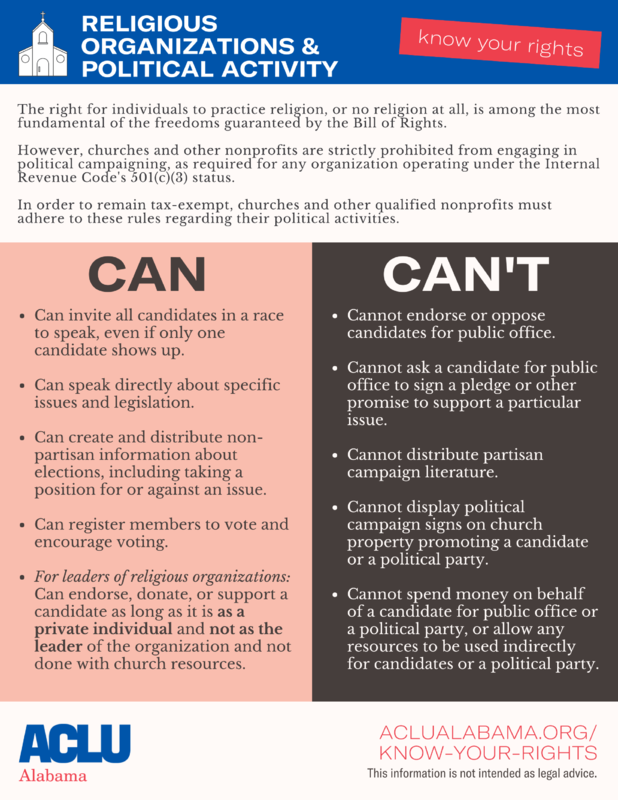 However, churches and other nonprofits are strictly prohibited from engaging in political campaigning, as required for any organization operating under the Internal Revenue Code's 501(c)(3) status. In order to remain tax-exempt, churches and other qualified nonprofits must adhere to these rules regarding their political activities. This information is not intended as legal advice. Download a copy of the handout here. Can invite all candidates in a race to speak, even if only one candidate shows up. Can speak directly about specific issues and legislation. Can create and distribute non-partisan information about elections, including taking a position for or against an issue. Can register members to vote and encourage voting. For leaders of religious organizations: Can endorse, donate, or support a candidate as long as it is as a private individual and not as the leader of the organization and not done with church resources. Cannot endorse or oppose candidates for public office. Cannot ask a candidate for public office to sign a pledge or other promise to support a particular issue. Cannot distribute partisan campaign literature. Cannot display political campaign signs on church property promoting a candidate or a political party. Cannot spend money on behalf of a candidate for public office or a political party, or allow any resources to be used indirectly for candidates or a political party.